Dilip Singh Rana may not be so familiar. But what about ‘The Great Khali’? Does that sound familiar? Of course, yes. Dilip Singh Rana is the original name of the internationally renowned wrestler The Great Khali. A huge man, 7 feet 3 inches tall weighing about 196 kg comes from the holy land of Himachal Pradesh.Dilip Singh Rana was born in a poor family in a very small village of Sirmaur district. It is said that till Dilip Singh Rana’s initial teens Dilip Singh Rana’s growth was normal, but suddenly it took a rapid edge and Dilip Singh Rana grew like anything. As the family was poor and it was very difficult to them to make both ends meet, moreover Dilip’s hunger growing day by day due to Dilip Singh Rana’s size was a big problem. As a result, Dilip had to work as a labourer on the road cutting stones and other manual work to earn the daily bread to kill the hunger of Dilip Singh Rana’s belly. Life was at its worse for this man of extraordinary built.It was Dilip's serendipity that a Deputy Superintendent of Police got Dilip Singh Rana’s eye on him and was very much influenced by Dilip Singh Rana’s physique and immediately took Dilip with him into the Punjab police. There Dilip Singh Rana did regular workouts in gym and made is physique in shape. As a result Dilip Singh Rana also won the ‘Mr. India’ award for bodybuilding. Now there was no looking back for him. Dilip Singh Rana went to California to learn the tact of Professional wrestling. Dilip Singh Rana took coaching there for several years and after this rigorous schedule Dilip Singh Rana made Dilip Singh Rana’s entry into the world famous ‘World Wrestling Entertainment’. Dilip Singh Rana has won various wrestling events there defeating the famous contender ‘The Undertaker’. 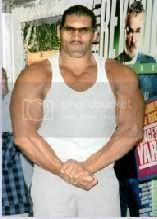 Dilip Singh Rana’s gigantic physique even took him to the couple of Hollywood movies. It is really a matter of real pride for us all that a son of Himachal is making our name proud throughout the world.